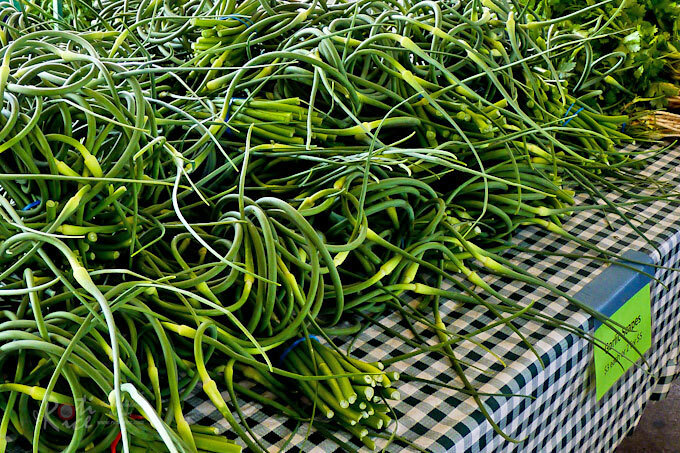 Never tasted garlic scapes? 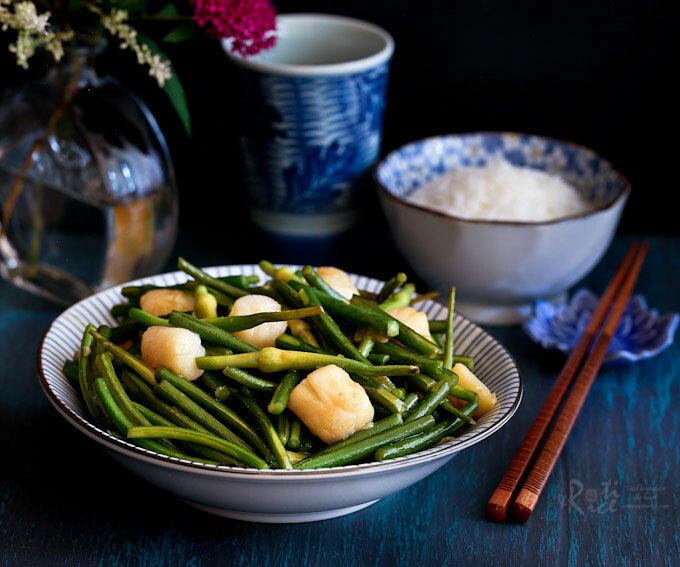 Try this Garlic Scape and Scallop Stir Fry. It is fragrant, delicious, and takes only 20 minutes to prepare. If you have never tasted garlic scapes, I am not surprised. I only recently had a chance to try it. It is seasonal and I was delighted to see them at the farmers market in downtown Minneapolis that I have been going to lately. There were lots of it on sale but unfortunately there were not too many takers. At first glance, they look somewhat unusual. Their firm stalks curve in circles unlike straight Chinese chive flowers. One’s thought would be, “What or how would you cook that?” Being Chinese, my instinct is to do a stir fry. 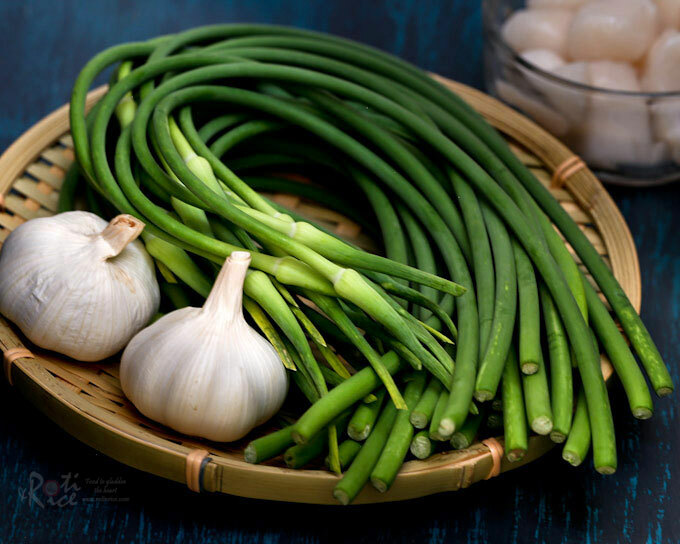 Since garlic scapes are actually the flower of the garlic plant, pairing it with scallops or shrimps in a stir fry is a no-brainer. I trimmed off the bud ends which were beginning to turn yellow and simply snapped them into 2 inch lengths. Like asparagus, they tend to get woody near the stalk ends and have to be “stringed” which isn’t difficult at all. 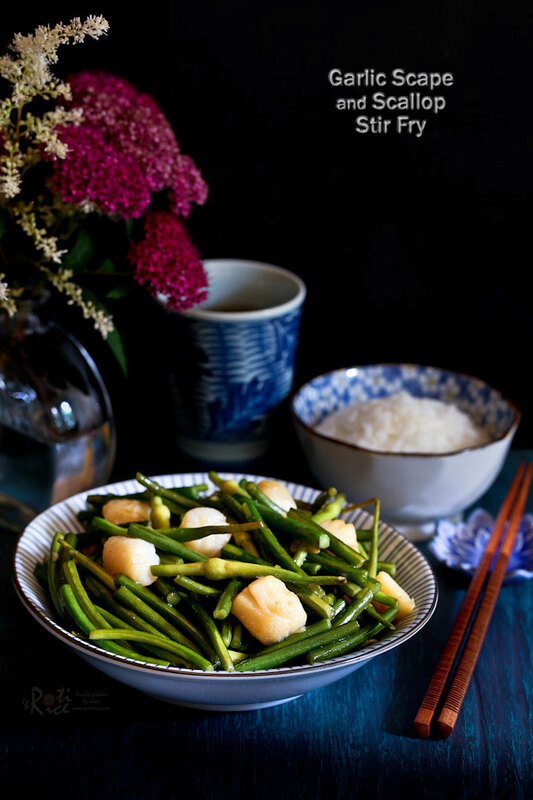 Depending on the maturity of the garlic scapes, you may want to stir fry them anywhere from 3 to 5 minutes. An alternative is to scald them in boiling water for a couple of minutes before tossing them into the wok. I simply stir fried them in the wok for about 4 minutes to give them a slightly “smoky” flavor. They were deliciously tender and mildly garlicky. I think they paired well with the bay scallops. Wash and drain garlic scapes. Snap into 2 inch lengths starting from the bud end. As you near the stalk end, string the scape. Once it is too woody to break, discard. Heat a wok or large fry pan. Add 1 tablespoon vegetable oil. Fry prepared garlic scapes for 4 to 5 minutes. Remove and set aside. Add remaining 2 tablespoons vegetable oil to the wok. Fry garlic for 30 seconds. Add scallops and continue to fry for another 1 minute. Return garlic scapes to the wok. 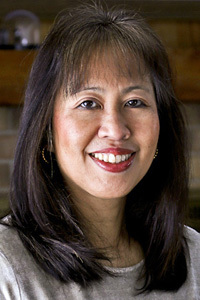 Add soy sauce, Shao Hsing cooking wine, and salt. Fry for another minute. Stir in cornstarch mixture. Allow it to thicken. Turn off the stove. Drizzle sesame oil on the top. Transfer to a plate and serve immediately. 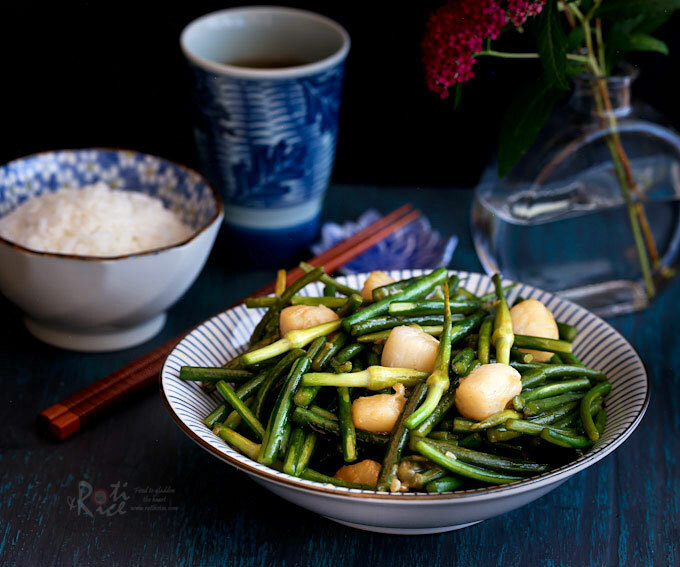 So, the next time you encounter garlic scapes, I hope you will give this Garlic Scape and Scallop Stir Fry a try. One more summer vegetable to enjoy and all the more reason to look forward to the warm days of summer. Step 3 instructs you to add the garlic, I see it in the picture, but do not see it in the ingredients. How much garlic? I have been very curious about garlic scapes. This look like a good place to start! Please use 2 cloves of garlic. I have added it to the recipe. Thanks for pointing it out and yes, this simple recipe is a good place to start. Garlic scapes are a treat if you can find them.